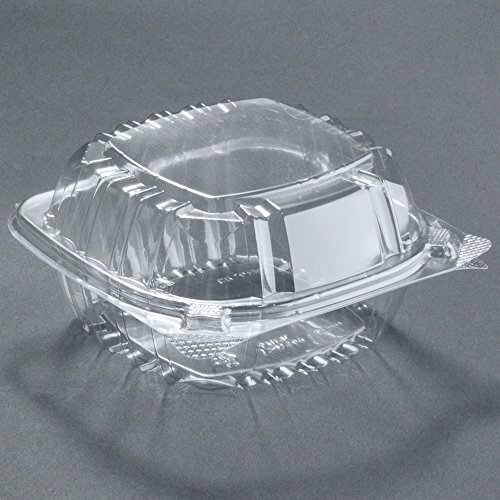 Dart C57PST1, 6"x6"x3" ClearSeal Clear Sandwich Container With Clear Hinged Lid, Take Out Pastry Dessert Fruit Deli Food Disposable Containers are an excellent storage or carryout solution for your foodservice establishment. 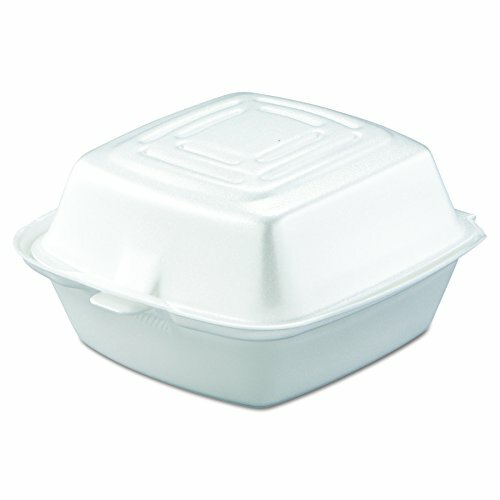 Made of oriented polystyrene, these containers are remarkably strong and reliable. The durability of the entire construction is enhanced by the ribbed sidewall surface. The crystal clarity ensures superior product presentation. Any leaks or messy crumbs are avoided due to the tight perimeter seal. The lid can be securely closed with dual bar-locks and easily reopened with slip-resistant tabs. The stacking platform makes merchandising a snap. Perfect for pre-packing your specialty sandwiches, salads, pastas, and pieces of cake to go! Dual bar-locks provide a snap-tight secure closure while easily accessible flared gripper tabs simplify opening. Made of oriented polystyrene, these containers are remarkably strong and reliable. The durability of the entire construction is enhanced by the ribbed sidewall surface. Any leaks or messy crumbs are avoided due to the tight perimeter seal. The stacking platform makes merchandising a snap. Length: 6; Width: 5 13/16; Height: 3. Better the environment with eco-friendly food containers by committing to HeloGreen! Other alternatives are a thing of the past! 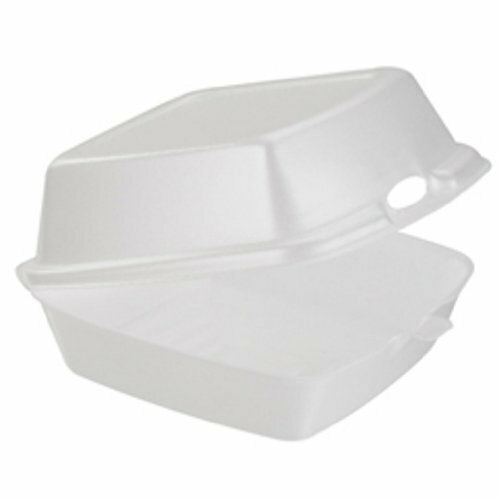 Styrofoam containers take many years to break down, and paper product clamshells cannot withstand moisture for long periods of time. And there are HeloGreen eco-friendly food containers that completely durable, strong, and soak-proof made from mainly cornstarch, a renewable resource, and small percentage of PP#5 used for durability and strength helps reduce your carbon footprint!! Make a commitment to save our planet by purchasing our eco-friendly food containers! If you are unhappy with your product, we will replace it completely free on us! What are you waiting for? Think Green, Choose HeloGreen and start saving the earth! SAVE YOURSELF FROM DIRTY HANDS, STAINS AND LEAKAGE - No more worries about food liquids seeping through while on-the-go and staining your favorite pants and car seat! You can carry these containers anywhere, anytime, anyplace without any mess! Unlike other alternatives such as paper-based containers leak and break apart constantly. Say hello to clean hands and pants! THINK ABOUT THE NEXT GENERATION BY GOING GREEN - Billions of tons of plastic have been made over the past decades, and much of it is becoming trash and litter. And plastic takes more than 400 years to degrade, so most of it still exists in some form - By committing to HeloGreen food containers made from cornstarch, a renewable resource, and small percentage of PP#5 for durability and strength, and its proprietary additive helps reduce your carbon footprint! 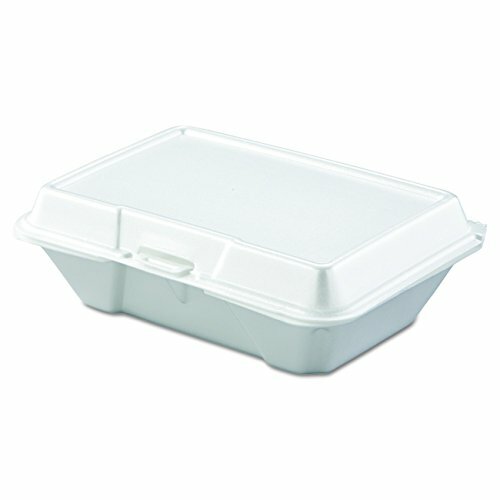 REHEAT AND PRESERVE LEFTOVERS CONVENIENTLY - Save time and troubles from transferring foods when you're trying to reheat or preserve your food to tableware when you can microwave and freeze foods with HeloGreen food containers that can withstand temperatures from -4 to 248 degrees Fahrenheit. NON-STICK SURFACE AND PREMIUM QUALITY CONTAINERS - HeloGreen eco-friendly containers are durable, strong, and secured with a satisfying slit-in front closing mechanism unlike other containers need extra support of rubber-bands to close properly. Also, you can enjoy all of your meals without worrying about your portions being stuck to the bottom of the containers due to its non-stick surface material. 100% GUARANTEED - We guarantee your containers will arrive without any issues or we will replace it completely free on us! Feel free to contact us at any time. What are you waiting for? Think Green, Choose HeloGreen and start saving the earth! Lock in freshness with clearseal's exclusive perimeter seal designed to maximize product freshness and reduce leaks. Bar-locks provide a snap-tight secure closure while easily accessible gripper tabs simplify opening. Clearseal, the clear choice for accentuating the full appeal of your food with confidence. Perimeter seal completely seals container for maximum freshness and increases customer satisfaction by maintaining product quality. Leak resistant prevents leaks of dressings and sauces and reduces cleaning costs. Bar-locks gives audible snap and excellent multiple closure and reduces customer complaints, increases repeat business. Opening tab makes container easy to open and increases operator sales. Grippers on opening tabs provide secure grip when opening container and increases customer satisfaction through ease of use. Label window allows for product labeling and scanning of item rightside up and increases efficiency of check-out lines. Registered stacking platform provides greater stability of merchandising displays and also avoids mishaps. Clear packaging allows for pre-packaging with an upscale appearance and enhances appeal of both food and operator. Wide sidewall ribbing expands open view of product and simplifies customer browsing and increases impulse sales. 5.3" Length by 5.4" width by 2.6" height. 13.8 fluid oz capacity. 3.2' Case cube and 14.7lbs case weight. Convenience is the key with Dart foam hinged lid containers. Secure closure improves handling and helps protect against accidental openings. High insulation qualities make them ideal for transporting and storing both hot and cold foods. Carryout service wouldn't be complete without them. Twelve popular sizes of Dart foam hinged lid containers feature the Performer perforated hinge. This one-of-a-kind feature allows the container's lid to easily be removed, making for a less cluttered dining experience and providing an extra plate for meal sharing. 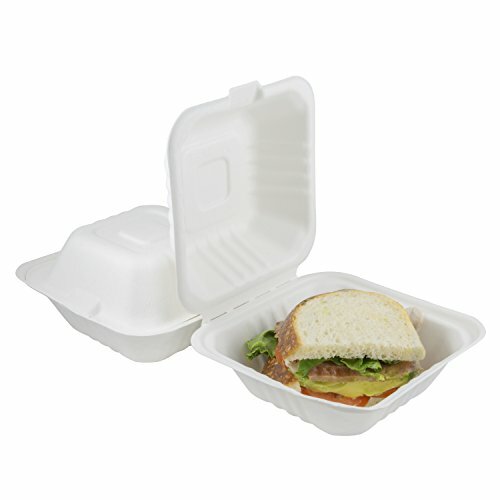 Dart foam hinged lid containers are available in both white and black. One-piece construction eliminates lid confusion and increases operational efficiency. STRONG, LEAK-PROOF, ECO-FRIENDLY CLAMSHELL BOXES made with responsibly sourced plant fibers are the best takeout boxes for your carryout needs AND for your planet! While other restaurant food containers for take out are made from earth-harming petroleum or tree sources, ours come from a zero-carbon-emissions facility and are made from agricultural by-products (wheatstraw and sugar cane) that would otherwise be thrown away. 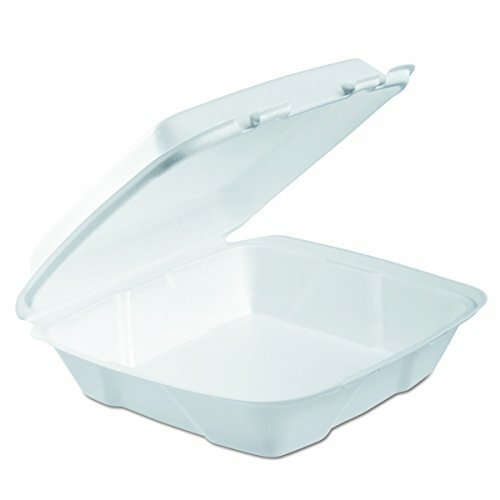 Our hinged clamshell boxes are microwaveable (up to 200 degrees) and resist leaking, even for moist foods! 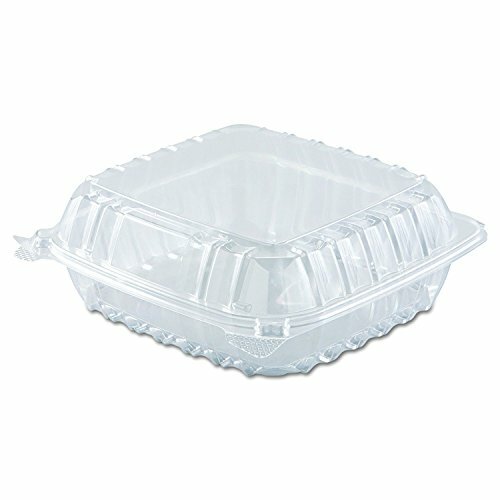 Can I use these takeaway boxes for hot food? Absolutely! 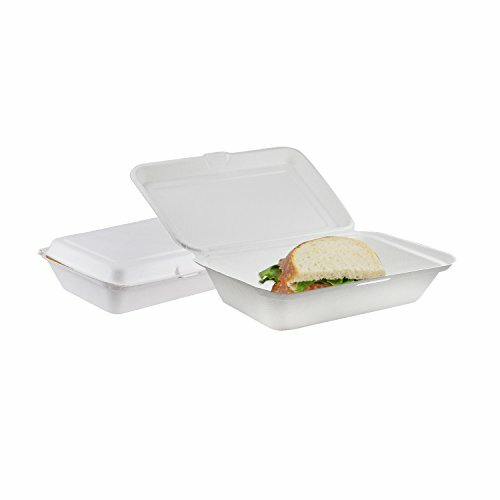 As long as the food you serve is under 200 degrees F, these biodegradable boxes will maintain their sturdiness! Cold foods are also fine! What is this plant-based fiber made of? The fiber that makes up our food containers comes from fully renewable unbleached wheatstraw and sugarcane fibers. The solid, pressed fiber is soak-proof, but slight condensation may collect on the bottom of the box when hot food is being served in them. 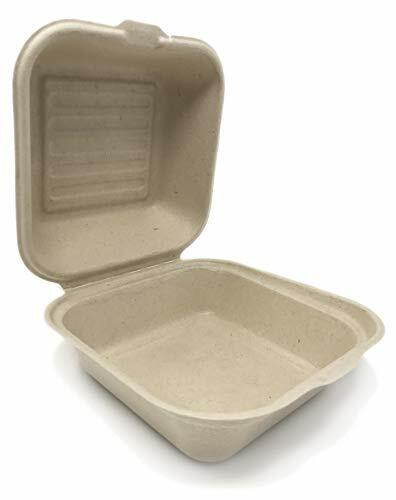 Why should I choose wheatgrass fiber clamshell containers over other biodegradable boxes? We're so glad you asked! By choosing a renewably sourced disposable container, you choose a sustainable world beyond the biodegradable box you're eating from. Need disposable utensils? Search Amazon for Avant Grub's Cutlery Combo Pack listing to complete your takeout food supply run! SAFER TO MICROWAVE. Plastic styrofoam containers leach out chemicals when microwaved, and microwaving paper is a fire hazard! Get plant fiber boxes that are chemical free and flame-resistant! MORE ECO-FRIENDLY THAN FOAM. Our natural, tree-free plant-based food boxes keep your food warm or cold without sticking around in a landfill for hundreds of years like styrofoam containers. CERTIFIED & SUSTAINABLY SOURCED. Our plant products are certified biodegradable & compostable, and our fibers are from annually renewable agricultural by-products of plant-based food production. A STURDY, LEAK-PROOF PLANT PRODUCT. Paper containers are also earth-conscious, but they don't hold up well to moist foods like our boxes do. Save yourself the trouble of a wet, leaky paper mess! 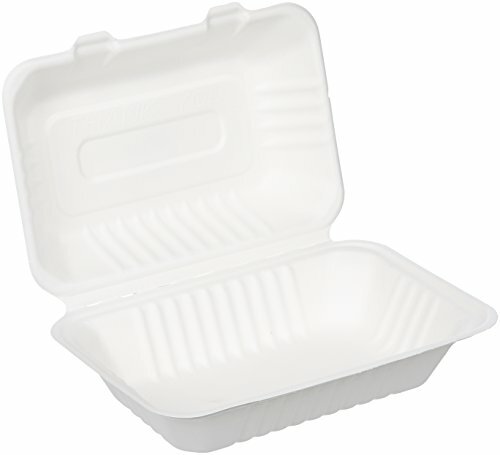 Made of oriented polystyrene, these stackable clamshell containers are remarkably strong and reliable. Excellent solution for cookies, pastries, desserts, snacks, appetizers, deli etc. 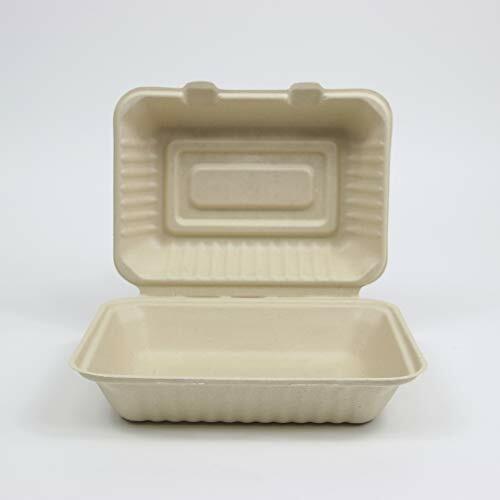 100 packs of 100% biodegradable to-go containers Our rectangular clamshell-style hinged to-go restaurant containers are made from eco-friendly bagasse, a 100% biodegradable and compostable byproduct of the mighty sugar cane. They come in bulk counts of 100, making them perfect for commercial or private use. Choose between three sizes: 6" x 6" that's meant to store side order items, and 6" x9" as well as 8" x 8", better for main dishes, sold in single and triple compartments (great for separating proteins from side dishes). Both the top and bottom halves have 2" depths and can safely hold 3 cups of food. When reheating food, our containers will not leak or deform with oil up to 250F (120C) and water up to 212F (100C). 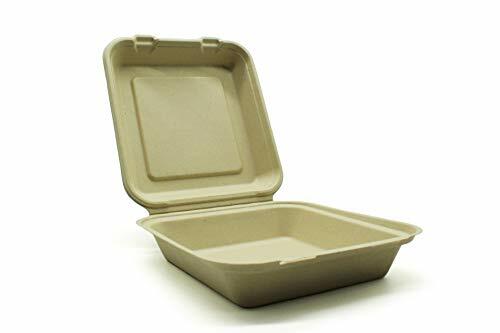 100 COUNT OF CLAM-SHELLED TO-GO CONTAINERS: Sourced from eco-friendly bagasse, a 100% biodegradable and compostable byproduct of the mighty sugar cane. This results in a non-toxic container that is safe for food storage and consumption and vastly superior to cheap and unsavory Styrofoam to-go boxes. AVAILABLE IN THREE SIZES: Choose between three sizes: 6 x 6, that's meant to store side order items, and 8 x 8 as well as 6 x 9, which are more appropriate for main dishes, sold in single and triple compartments (great for separating proteins from side dishes for those who hate when their foods touch each other). FDA APPROVED: Our Hinged boxes will not transfer harmful chemicals to your food. Nor will they melt, leak or deform when heated in the microwave or regular oven. So your food stays safe, you save on water and time spent doing dishes, and the environment feels just a little bit better. Good deals all around. 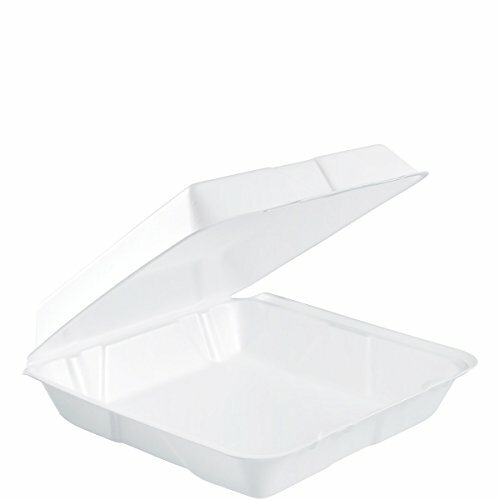 MICROWAVE SAFE: Our biodegradable containers, constructed of sugarcane fibers, are microwaveable and freezer safe! MAKE A DIFFERENCE: Small things make a large impact! Each individual container is made from recyclable bagasse, one of our many plant-based substitutes. Our to go premium organic straws are out to replace materials that are harmful to our environment. Mr. Green Guys was started by two brothers with a sense of accountability to protect our environment. We believe that if each of us made small, but responsible choices in our own lives; together, we can make a large difference. Today's fast paced society encourages the consumption of single-use disposables. These disposables are filling up landfills and our oceans causing tremendous damage to our planet and its inhabitants. This problem that we are all facing has no easy solution. The best solution to single-use disposables is to not use them at all. We know that this isn't always possible, so Mr. Green Guys created a line of disposable tableware made from rapidly renewable resources. When these products are composted in an industrial facility, we are able to achieve an end of life that creates organic soil that can be returned to the earth to grow more food. Composting is the planet's own method of organic recycling. It is a process that has been going on for billions of years. Essentially, it is Nature returning to the earth that of which came from the earth to create the building blocks for future growth. All of the products that we carry are plant based and contain NO Plastic. They are certified to ensure that under Industrial Composting conditions, 100% of these products will turn into organic, nutrient rich soil that can be used to grow future food supply. Unless the product that you purchased is certified for home composting, it needs to go to an Industrial Composter in order to create the proper conditions for to be fully biodegradable. Even though you are buying an "eco-friendly" product, it may never biodegrade in a landfill. To find a composter close by, go to www.findacomposter.com. Wheatgrass is Very heavy duty, withstands heat, and can be composted in an Industrial composting facility. This Product is Unbleached, Microwaveable Hot and Cold, Solid and Liquid Food Safe. 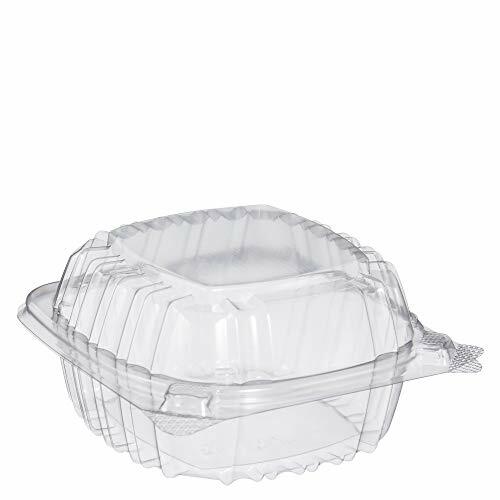 A perfect small sized to go container choice for sandwiches, burgers, or catering needs. 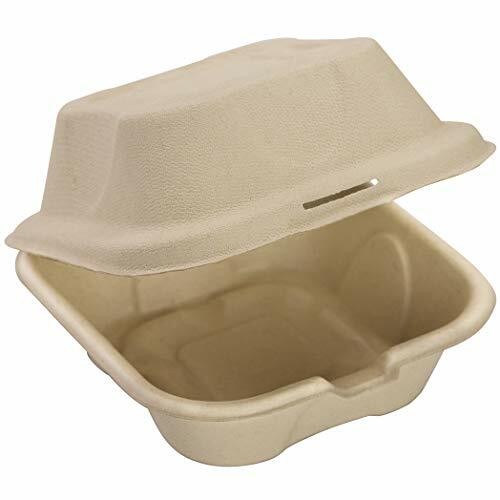 This 6 compostable clamshell is Eco Friendly and certified to meet ASTM standards of composting to be fully biodegradable within a matter of months leaving no footprints or harmful byproduct behind in an Industrial Compost Facility. 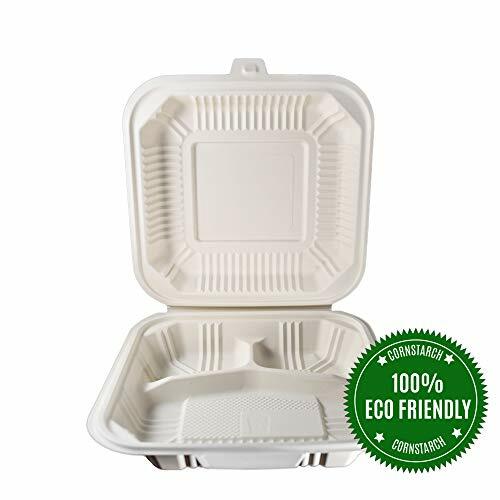 100 packs of 100% biodegradable to-go containers Our rectangular clamshell-style hinged to-go restaurant containers are made from eco-friendly bagasse, a 100% biodegradable and compostable byproduct of the mighty sugar cane. They come in bulk counts of 100, making them perfect for commercial or private use. Choose between two sizes: 6" x 6" that's meant to store side order items, and 8" x 8", better for main dishes, sold in single and triple compartments (great for separating proteins from side dishes). Both the top and bottom halves have 2" depths and can safely hold 3 cups of food. When reheating food, our containers will not leak or deform with oil up to 250F (120C) and water up to 212F (100C). 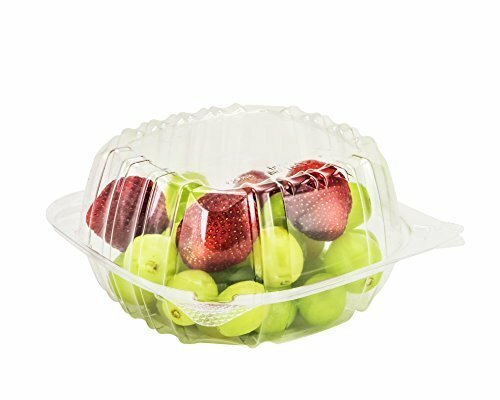 Better for you, better for the earth Plates and bowls from bagasse are pressed through high-heat and high-pressure processes. Bagasse products biodegrade within 60 days. When that natural degradation occurs, those products provide natural ingredients back into the environment. These products are the perfect alternative to those unfortunate Styrofoam containers. Toxic coated Styrofoam contains harmful chemicals that are released when you heat containers made out of the synthetic resin in a microwave (the term 'nuking' has never been so appropriate before). And if that weren't enough, Styrofoam is non-biodegradable. So every time you see a to-go container so thoughtfully left behind on the ground somewhere, remember to yourself -- people are the often the worst and that container is there forever. AVAILABLE IN TWO SIZES: Choose between two sizes: Choose between two sizes: 6 x 6, that's meant to store side order items, and 8 x 8, which is more appropriate for main dishes, sold in single and triple compartments (great for separating proteins from side dishes for those who hate when their foods touch each other). Protect the environment by choosing to use these Green Earth Brand Containers. Made from sugarcane fibers and free of un-natural dyes and colors, these containers are the ecofriendly alternative to styrofoam and plastic. BPI (Biodegradable Products Institute) certified compostable in industrial facilities, not suitable for backyard composting. Bagasse is one of the best materials when it comes to handling hot temperatures. Store your hot or cold food with confidence when you use Green Earth containers. Not only limited to cooked food, these containers can also be used to hold your ingredients, spices and a variety of items. They are liquid and oil resistant, as well as light cut resistant. NOTE: Storing liquids for a long period of time may over-saturate the container. For extra protection when storing food, we recommend lining the bottom of the containers with foil to prevent leaks or breakage from the bottom. Clean and Green is our Perfect Dream. BPI Certified Compostable, Environmentally Friendly, Biodegradable, and Gluten-Free. Made from Bagasse (Sugarcane Fiber). Contains No Plastic or Wax Lining. Perfect for holding or storing food or snacks. Suitable for Hot and Cold Food. Oil & Liquid Resistant. Microwave Safe. Ideal for Commercial Use in Restaurants, Diners, Cafes, and Food Trucks. Also Suitable for Personal Use. Total Papers 9"x6"x3" disposable clamshell food container, naturally Strong & Sturdy, made from renewable, agricultural Wheat Stalk fibers derived from harvested, Tree-Free, Non-Bleached, Chlorine Free, Dye Free, Gluten Free, No BPAs, Microwave safe, Hot & Cold temperature, withstands heat up to 200 degrees Fahrenheit, use it for any occasion, 100% Biodegradable & Compostable. Saves our world from waste. Made from 100% natural sustainable & renewable Wheat Straw fiber (NO Bagasse, NO Bleach) Naturally Strong & Sturdy, Safe for Food. Best of the Best natural Earth-Friendly, Tree-Free, Non-Bleached, Chlorine free, dye free, Gluten free, no BPAs, no smells. Microwave safe, perfect for Hot or Cold food for any occasion, withstands heat up to 200 degrees Fahrenheit, Soak resistant. 100% Biodegradable & Compostable in either industrial facility or a home compost process. Ideal for restaurants, food trucks, to-go orders, parties, and other types of food service.